I love kitchen gadgets. Love. An idea of a good time for me is hanging out in a kitchen shop. I love to try out new things to see if they really work and make life easier in the kitchen. But I'm pretty selective about what I bring into my own kitchen because, well, my space is limited and I don't want a lot of clutter. And I've found that there are some simple old tried and trues that may not be the fanciest, but they are the tools I go back to regularly while the fanciest can often end up collecting dust. Plus, they're affordable and last. So, in case you still have home cooks (or wannabes) on your gift list who you know would appreciate useful over fancy, here are some practical ideas that pack a punch and can keep them happily cooking. 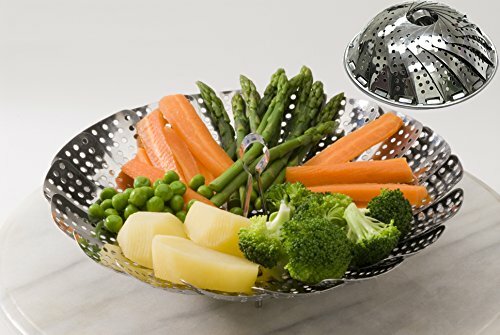 I use my steamer basket almost daily. Not only is steaming a fast and easy way to cook, it requires no oil to achieve moisture in the final product, provides a nice delicate texture, brings out the natural flavor and color while holding shape, and retains water-soluble nutrients unlike most other methods. It also requires very little liquid compared to boiling, and you can add different herbs and spices to the liquid to create all kinds of subtle, delicious flavors - it's fun to experiment. Almost any fresh veggie can be steamed, and steaming brings out the natural flavor while holding shape and color. The steaming process is usually done within 15 minutes and doesn't require a ton of prep. 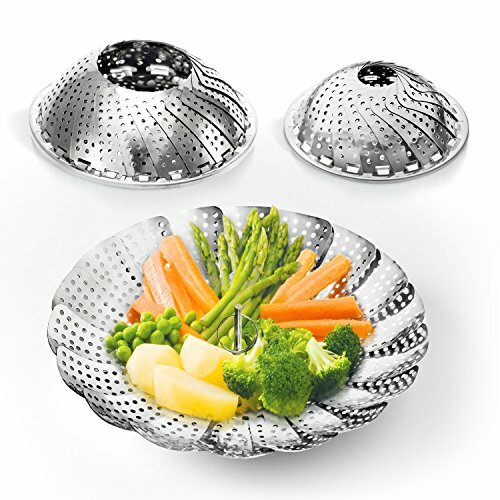 I like using a stainless steel basket compared to others - no leaching chemicals and easy to toss in the dishwasher. It fits easily into a drawer or cabinet and is used with whatever lidded pot is on-hand. I have two options above if you don't know how big the pots are of your gift recipient: get the smaller size so that it will more likely fit (the single on the left) or the two-pack, which includes both a large and a standard sizes. The baskets I've linked to are under $10 each, so it's a reasonable yet impactful gift idea. For nine months of the year, I make soup on a regular basis. Probably 70% of those soups are blended. An immersion blender allows you to make a smooth, creamy soup without cream and without transferring hot soup out of the pot. I have tried ladling soup into my blender, only to get a big hot mess. The immersion blender is so easy. It allows blending right in the soup pot, and it does a great job of getting it all blended. 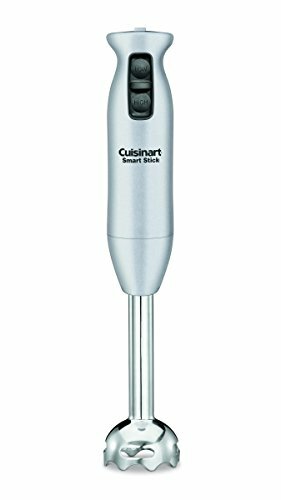 I have had my Cuisinart Smart Stick for years now, and it's still kickin' it. There's a Smart Stick 2 now for about $52 at Amazon; one like mine is about $32. 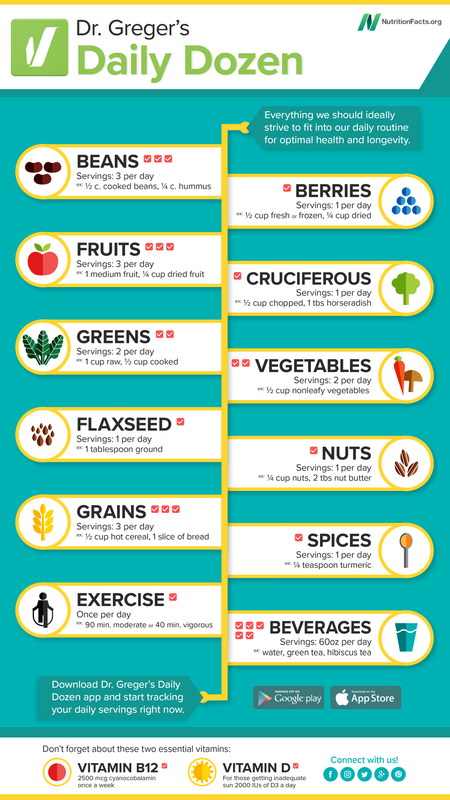 This is a huge help in the kitchen, one they'll surely be thankful for! At our house, Sunday night is usually pizza night. 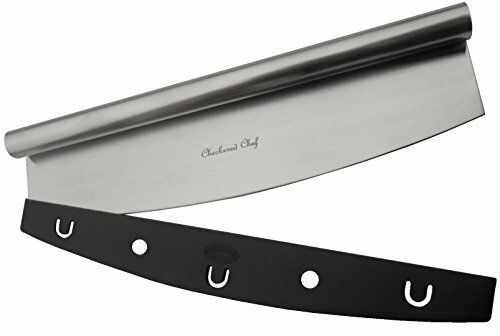 We currently have the Checkered Chef 14 inch stainless steel rocker blade, and it works great for large round pizzas - quick and easy, and since it's really sharp I'm glad it comes with a blade cover. We stick it in the top rack of our dishwasher and it cleans up just fine. 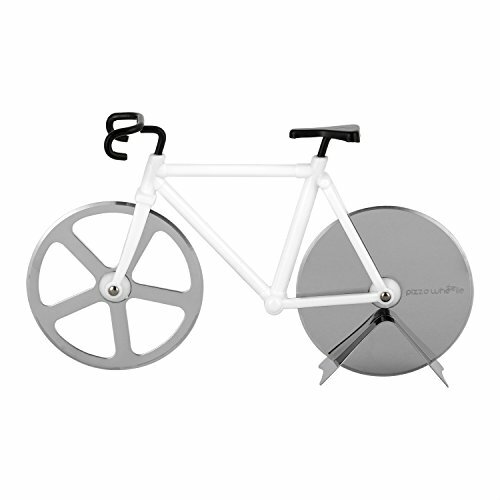 If you're not sure if you're giving your gift to someone who has a large round pizza stone or pan, wouldn't the Bicycle Pizza Cutter be fun? I will admit, I don't have this yet (it may be given to a bicycle enthusiast at our house for Christmas, ssshh!) but the reviews are actually good for its functionality, and it wouldn't matter what size pizza is made. It's also dishwasher safe. I would choose one with stainless steel wheels, like the one above. It even has a kickstand for displaying! Each of these are currently under $15. Well, there's my quick-and-clean shopping guide for the cooks in your life. I will be taking a break with my family over the next couple weeks, so will posting here again in the new New Year. I'm ready for it! I hope you and your loved ones have a very happy holiday season.